Great photo of Gerry Adams and Prince Charles about to shake hands by Brian Lawless of PA.
A free lifetime subscription to thebrokenelbow.com to the reader who composes the best bubble captions capturing the thoughts going through the heads of the two men as they are about to meet. This entry was posted in Uncategorized and tagged Gerry Adams, Prince Charles. Bookmark the permalink. Charles: Who’s the bearded fellow in a suit that doesn’t fit him? Gerry: I didn’t wash my hands after going to the toilet. Charles: Hope I can still squeeze out a silent fart. 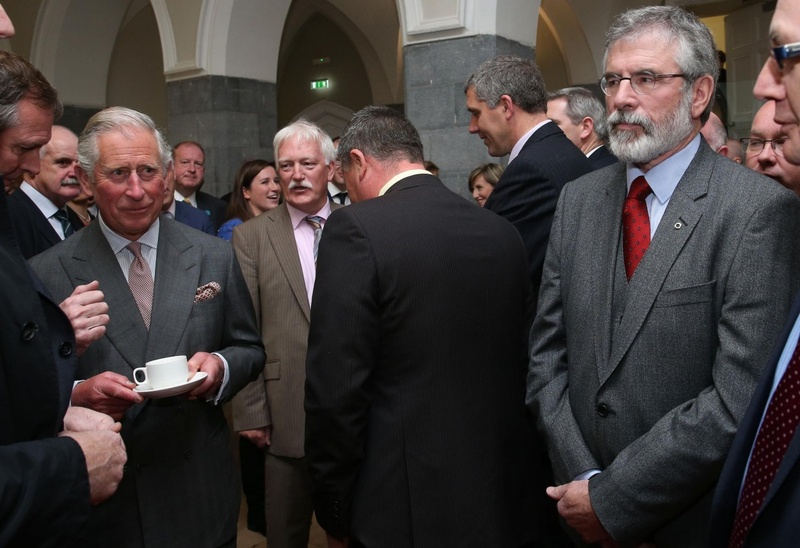 Charles: ‘Are you one of those Fenian chappies? Charles: “I’ve never denied being Colonel-in-Chief of the Parachute regiment. Charles: I spy with my little eye something beginning with spout. One lump or two in your tea, Mr Adams Sir?